It was a strange, old, ugly fence built out of logs, and it was starting to fall down in spots. Pippin had started escaping the back yard at night. However he was getting out, he couldn’t get back in, so he’d sit on the front porch and cry (loudly) in the middle of the night till we woke up and let him back in. We suspected he was using the concrete wall we added for the waterfall this past summer to jump the fence (he has no front claws so he couldn’t be climbing out). 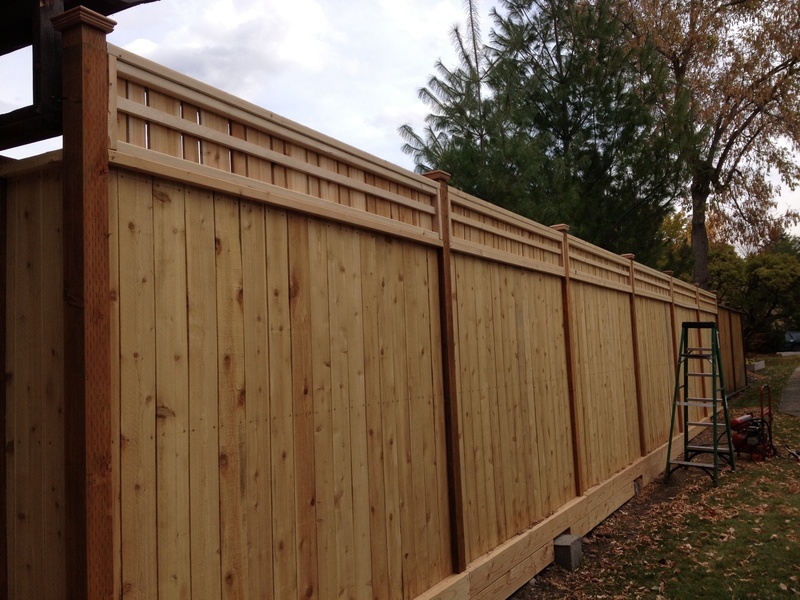 Anyway, we replaced the fence with a more normal-looking fence, complete with a custom trellis to make it tall enough (hopefully) keep Pippin in. We finished it up back in mid-October. Pippin stayed in the yard for several nights so we thought we solved the problem. We had several cold nights, so on those evenings we locked both cats up in the cat room to keep the heat in, so he didn’t have any opportunity escape for a while. Until this morning (October 31), around 7 am when we heard Pippin crying at the front door again! At least this time he waited till morning instead of yelling in the middle of the night. 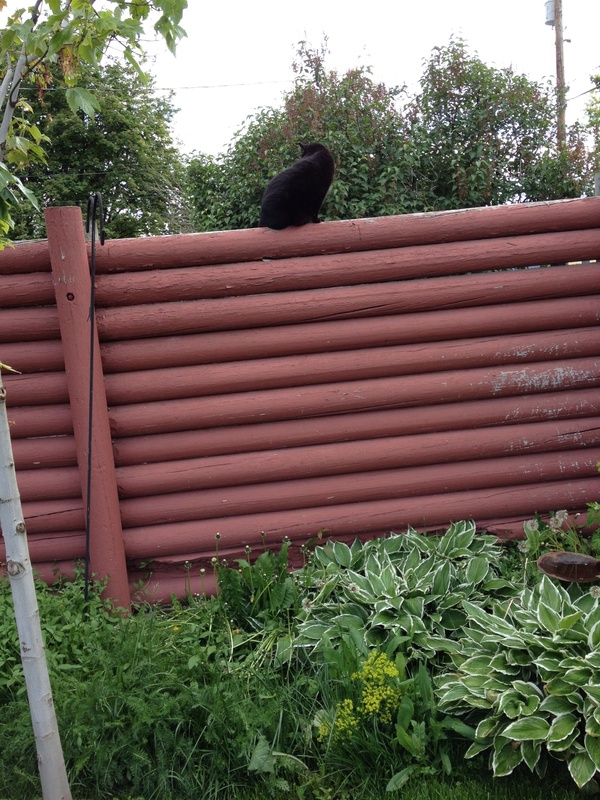 Hmm…a black cat with amazing escape artist abilities…and he waited until Halloween to demonstrate that he could still overcome the fence. So…from now on, that cat is getting locked up at night. 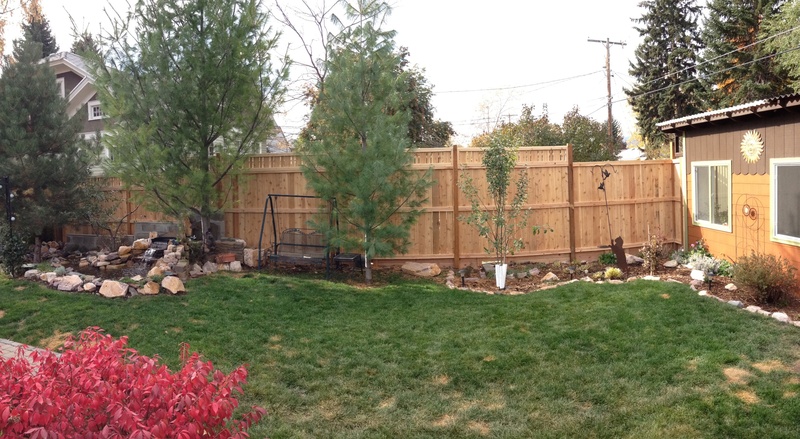 Oh well, it is still a really nice fence and I’m glad that project is done – one less thing to worry about next spring. It was Totally the Cat’s Fault! It all started with a cat learning how to use the dog door and ended with an expensive vet bill. Well, that may be bit of an exaggeration, but not much. Pippin has been slowly checking out the dog door for coming into the house. He likes being out in the backyard, and he likes his luxury kitty apartment, but sometimes he also likes to come in the house. He expresses this desire by using the barbecue grill as a stage; he gets up there and yells and yells and yells until we open the door for him. Then he just stands there for a minute, as though he isn’t really sure he wants in or not. He just wants the option to come in. Once he is in, he hangs out for a while before sitting at the back door and yelling again to be let out. He sort of reminds me of this. He might have figured it out anyway since his cat apartment also has a pet door installed, but it is a smaller, lighter one. 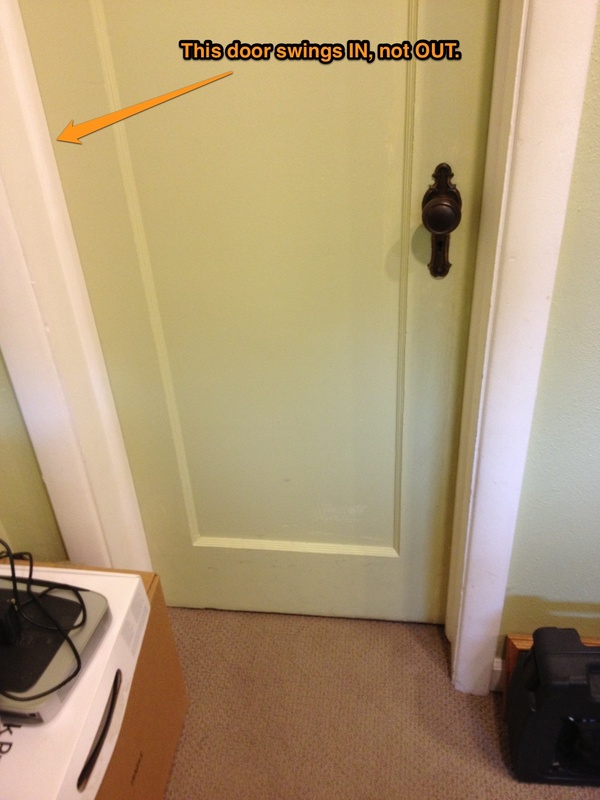 The dog’s door is big to accommodate the standard poodles and it has two flaps to better keep out cold air. 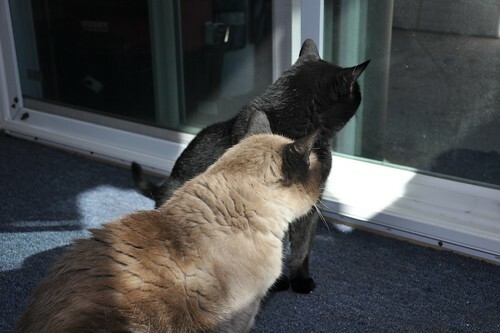 Still, once he got the hang of of the kitty door, it seemed likely that he would figure out the big dog door too. He’s certainly watched the dogs go in and out often enough. So Monday night we decided to run over to Noodle Express for a quick dinner. 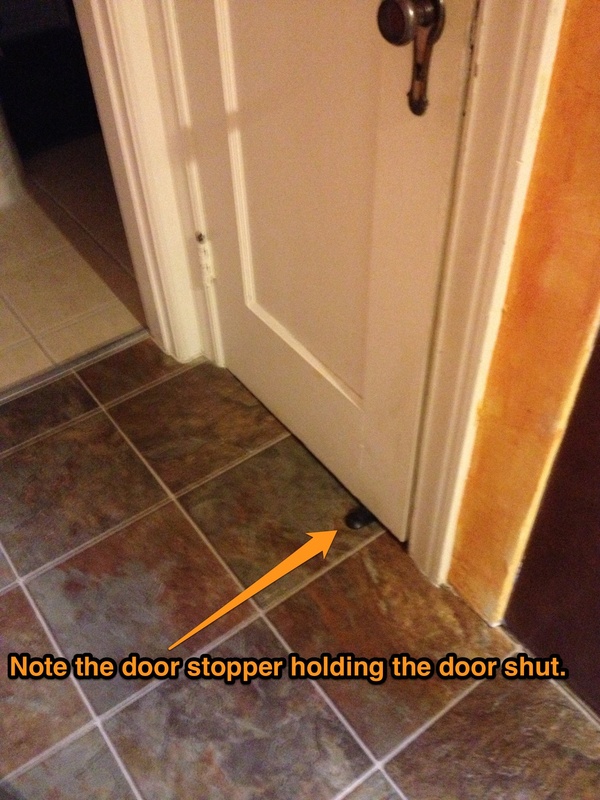 There are a few quick tasks we always do on the way out the door to make sure the dogs don’t get in trouble. 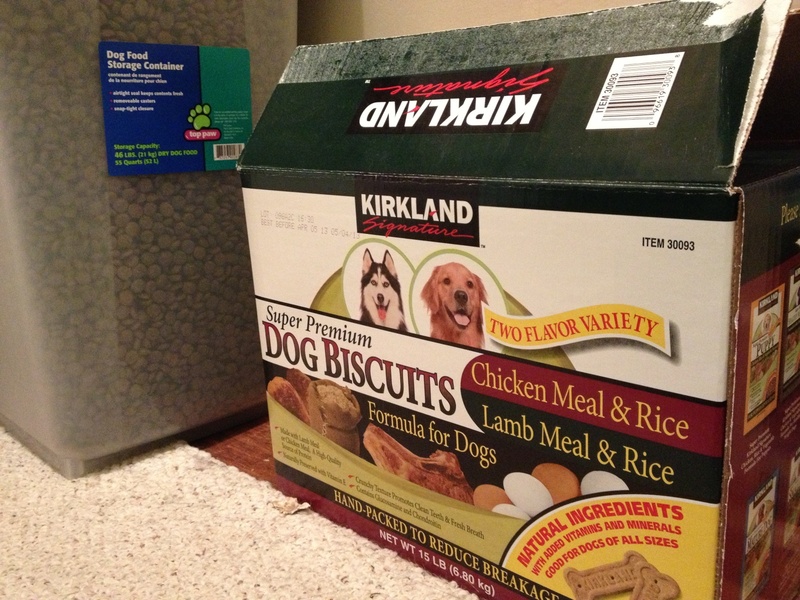 The most important one is to lock the kitchen trash can in the bathroom to keep the dogs from getting into it. They are very good at knocking it down and having their own personal doggy feast. Usually they like to drag all the trash into my office to munch on. I’m not sure why my office is such a great place for trash eating. Darwin’s crate is in there, so he has to sit there and watch them chow down right in front of him, which always struck me as sort of mean on the part of the other dogs. Anyway, we started getting ready to head out. I grabbed a coffee mug and a glass off my desk to put in the kitchen (just in case), intending to put away the trash next. On my way to the kitchen, I saw Pippin outside the dog door, standing up on his hind legs and poking at the door with his paw. Apparently all the time watching the dogs run in and out was starting to click. You could almost see the wheels turning in his little head. We both stopped what we were doing and watched him examining the door. He didn’t try going through just yet, but he was definitely thinking about it. We were getting pretty hungry for dinner, so we left Pippin to continue figuring things out and we headed on out to dinner. Ordered our usual rice bowls (I think they recognize us there) and two slices of their terrific chocolate mousse pie. Renee looked up from her rice bowl in horror and shook her head. We quickly realized that Pippin had distracted us during our normal pre-leaving tasks. We got “go” boxes for the rest of our rice and had them package up the mousse pie to go. Renee drove like a maniac to get home. I hoped that the dogs hadn’t had time yet to notice the unguarded trash can. When we pulled into the driveway, we knew we were in trouble. No dogs in the window watching for us. That was never good news. I hurried in to the house. Sure enough, the can was knocked over and trash spewed all over the dining room carpet. Abby was in the bedroom; she doesn’t usually get involved in this. Strangely, the usual suspects (Sirus and Myka) were not in the room. Cricket, on the other hand, was standing right in the middle of the mess. Despite her small size, Cricket is not innocent when it comes to trash. I used to have a lightweight plastic trashcan, and she could grab the bag in her teeth and pull the whole thing over. I switched to a heavier metal can like we have now and she couldn’t do that anymore, but she could still sometimes get on her hind legs and grab at any items up near the top. She’s probably the one who taught the poodles to even notice the trash can in the first place. 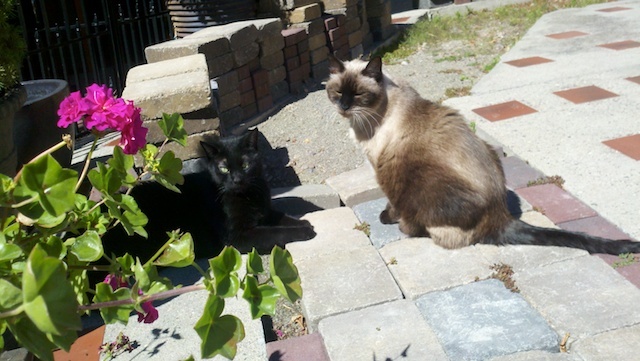 Sirus and Myka were out in the backyard for some reason. Maybe they had eaten enough and just weren’t interested. Or they were startled out of their feast by Pippin actually coming in through the dog door, for he had finally managed to do it. I looked in my office to see if they had hauled any trash in there, and saw Pippin sitting comfortablely on my desk. He had also left a light paw-print on the lid of my closed laptop. We cleaned up the mess (the vacuum was more than Pippin could take and he bolted back through the dog door) and tried to relax the rest of the evening, but we were concerned. The trash had contained two quart-sized bags of old gorp leftover from our summer backpack trips. Peanuts, raisins, dried cranberries, and M&Ms. All things that aren’t good for dogs. Sure enough, at three in the morning Cricket got up and started vomiting. Cleaning up dog vomit is never pleasant, but this was especially awful smelling puke. We stewed for a few minutes. Could we wait till morning, or should we just accept the cost of going to the emergency vet clinic? She sat uncomfortably in the bed and shook, not wanting to lie down and relax. We decided it was emergency and got up to take her in. I was still on the phone with the vet clinic when she threw up bloody bile in the kitchen. Definitely an emergency now. It was $95 up front at the emergency clinic. After a quick exam, the doctor said they would do an x-ray to check for any foreign objects, then provide some sort of charcoal treatment to bind up the rest of the trash and keep her from absorbing it, and then set her up with IV fluids so she doesn’t get dehydrated. We had to leave her there. We went home and went back to bed, although I really didn’t sleep all that well. Cricket stayed at the vet hospital all day Tuesday. They told us she vomited again in the early morning (around 7 and again at 7:30). They didn’t want her to come home until she had kept food down for several hours, so she had to stay there Tuesday night as well. They told us we could come visit with her, but we figured that would just get her stirred up and then upset her more when we had to leave her there again. Darwin wasted no time taking advantage of his sister’s absence; he tried to squeeze into her spot on the bed. This was OK at first because he curled up small. As the night went on, he sort of uncurled and stretched out and hogged a large portion of the bed. Did She Learn Her Lesson? We Sure Did! Finally this morning she was ready to come home. Apparently she was actually pretty good in her kennel and did not bark and cry as much as I would have expected. The doctor did say she started yapping at her when she didn’t get as much food as she wanted. She was happy to see us when we picked her up, but then turned her head away to shun us. She was very angry that we took her to that place and left her there. She seems to have forgiven me more quickly than Renee; I’m not sure why. Maybe she expects less from me? It would be really nice if Cricket learned a lesson from all this and would stay out of the trash from now on. After all, getting into trash just leads to bad things like vet clinics in the middle of the night, IV fluids, and sitting in a kennel all day. Unfortunately, I’m sure she has made no connection between the trash and the hospital stay. If she had the opportunity, she would do it all over again. Hopefully we’ll do a bit better at staying vigilant when it comes to dog-proofing the house on the way out the door. On a final note, I do know that the other dogs enjoyed some of that gorp as well. 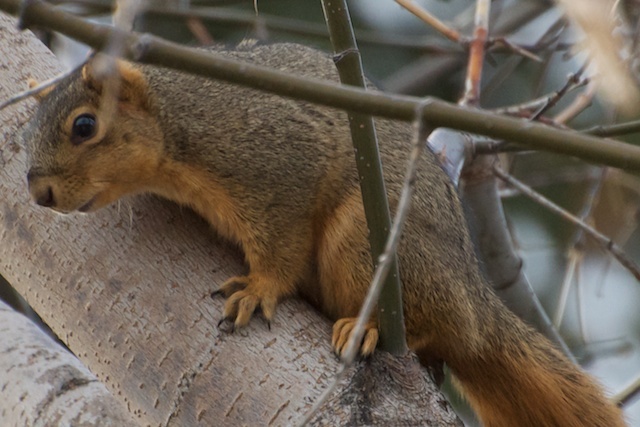 I’ve found plenty of evidence when poop-scooping the backyard, mostly in the form of undigested peanuts. But they seem to be doing OK and suffering no ill-effects, at least so far (fingers crossed that it stays that way). A very quick update about Pippin’s adventure in the pool last night. This morning he was a bit cranky after being cooped up inside all night. But his fur is shiny! It was rainy this morning, so I don’t think it was a huge hardship to be stuck inside. Later, after we opened up his cat door again, I looked out my window and saw him sitting by the pool, leaning over and staring down into the water. I guess danger kitty didn’t learn his lesson. So earlier this evening we were out puttering in the cat condo and visiting with the cats. Pippin got bored with us and left, but Xena continued to enjoy pets and scratches behind her ears. Renee worked on some tasks in the greenhouse, getting things ready for moving the pond plants in for the winter. The dogs fussed in the backyard, complaining that they are not allowed back in the cat condo. For some reason, I happened to look up right as Pippin came back to the sliding glass door. Water dripped off his fur into a puddle. He was completely soaked. That goofy cat went and fell in the pool again! And then managed to get himself back out. When we looked at the pool deck, there were puddles of water right around the pool ladder we installed this summer. So I’m thinking he was clever enough to use the ladder to climb out of the pool. That is a pretty smart cat! He didn’t seem too terribly traumatized, but took a long time working at cleaning the water off his fur. By the time we left the cats for the evening, most of his body was dry. We helped out a bit with towel and closed the cat flap to lock him in for the night. 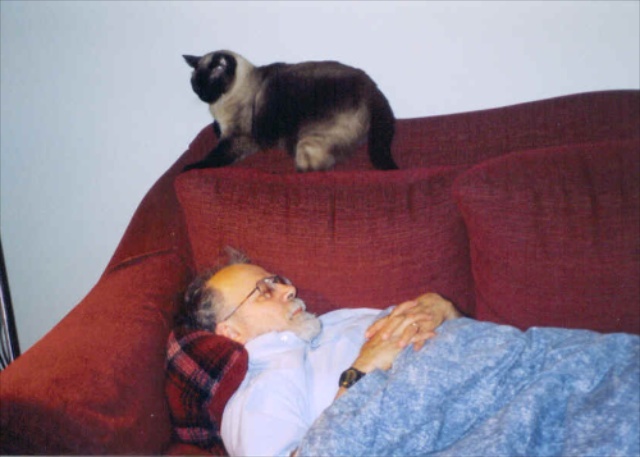 The cat is pretty smart, but sometimes he doesn’t have too much sense, and I could easily see him roaming around in the cold all night and getting chilled. I know he is going to be cranky by morning since he is used to having the whole yard for his entertainment at night. This is at least the second time Pippin has taken a swim since we moved in here. Last October he fell in early in the morning while I was working. I looked out the window to see why the dogs were barking and saw a small black shape swimming rapidly across the pool. I had no idea till then that cats could swim so well. He was at the shallow end when I first saw him; by the time I got outside and on the pool deck, he had gone the full length of the pool and was trying to pull himself out. This past summer, we saw some suspicious scratches on the side of the pool in the shallow end. I think he might have fallen in and then scratched up the pool wall with his back claws while climbing out. I’m glad he managed to get out that time since we weren’t around. Pippin, also known as danger kitty! 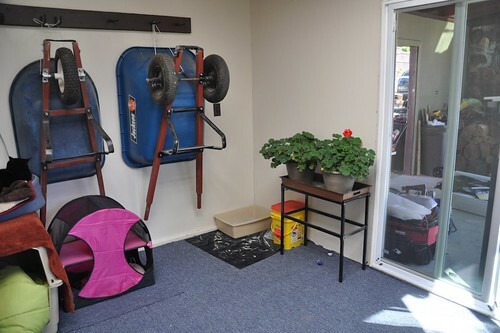 This year, we decided to solve some of the problems with the cat room — particularly the issues with the temperature and the high energy bill to keep them warm. 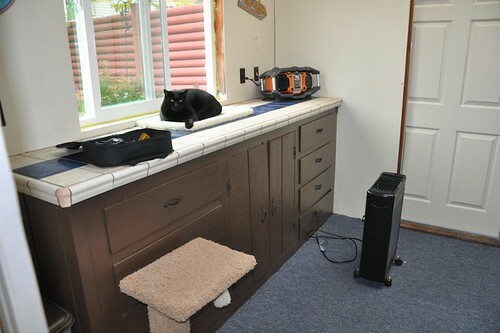 Also, we really wanted to make it a more comfortable home for the cats, so they could better enjoy living here. In other words, it was time to turn the old shed into a deluxe cat condo. Renee is already known as the “house project queen.” Since meeting her, I’ve helped with numerous home improvement projects (and I plan to write posts about more of them as well). But I think in some ways this particular project was the largest we’ve done since I met her. We did it over the weekends, and it pretty much took up every weekend in the month of September except Labor day (when we went backpacking), plus the first weekend of October. Not to mention the work that Renee did by herself on her days off when I was at my normal job. The project started innocently enough. We went to Home Resource to see if we could find an inexpensive door to install. Our plan was to frame out the opening of the shed and install a normal door. 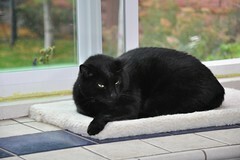 But we wanted to be sure and include plenty of glass, so that the cats would get lots of natural light. The shed also has a back room that serves as a greenhouse; last spring we started various seeds back there for the garden. The door between the cats’ room and the greenhouse was a heavy piece of wood on sliding rails that always got stuck. So we also wanted to find a way to fix that and make it easier to get in and out of that part of the room. At home resource, we came across a sliding glass patio door and this gave us a great idea. Instead of framing out the shed opening, we could install a sliding patio door! This would give them a real door, while at the same time still letting in as much light as they had before, AND it would look much nicer than the pieced-together wall we had originally planned. The opening was already about the same size as a standard patio door, so we wouldn’t have to frame anything. Unfortunately we made the mistake of running over to Home Depot to price new patio doors first. 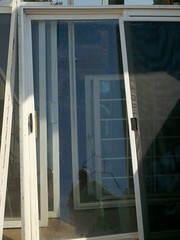 When we came back to Home Resource, the sliding glass door was already sold. Note to self: when you find the perfect item at Home Resource, either just buy it right away or at least put down a small deposit and have them hold it. NEVER just walk away! It was still a productive weekend. We put a new closet-type sliding door between the cats’ room and the greenhouse and replaced one of the windows in the shed with one we found at home resource. Later in that week, Renee picked up some nice tile from Home Resource (only spent about $10!) 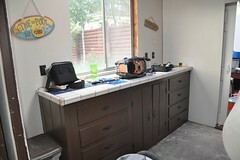 and tiled the countertop in their room. It made a HUGE difference! She also dug around and found some leftover paint and started painting some of the walls, which also helped lighten up the room. The second project weekend was mostly about cleaning up. 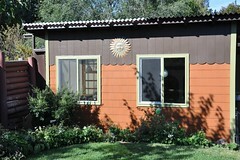 We had old plastic roofing panels that we had never finished installing the previous year. We pulled those out to return to Home Depot. 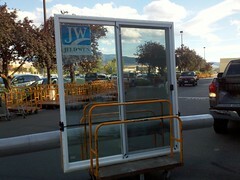 We also bought a new sliding glass door since we missed out on the great Home Resource find. Just a note: sliding glass patio doors are HEAVY! We also cleared out all the bales of straw, cleaned and organized, and did some more painting. The material for some of the walls had been damaged and stained due to water leaking in, and it was also pretty much just rough wood. It soaked up a lot of paint and took multiple coats to really cover. I think the area in which we planned to install the sliding door had once been used for some sort of old pocket door. It was just hollow space. So we took apart the walls and installed real insulation. This was a messy, unpleasant job but it was satisfying to see the finished walls and know that they cats would be warmer this winter! I also got to spend lots of time fighting to unjam and reload the staple gun. That part was not especially fun. Renee ignoring all the safety warnings on the ladder. Finally, it was time to work on the door. 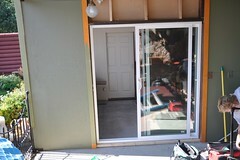 We wanted to install a 2×6 across the threshold for the new sliding door to rest on. This meant we needed to fasten the wood directly to the solid concrete floor. We used a Ramset tool for this. This is a powder fastening tool. To use it, you load a special nail, then load a special .22 caliber bullet. The tool acts like a gun, using the power of the bullet to drive the nail. Firing the Ramset to fasten the wood to the concrete. Renee's turn with the ramset. We ended up installing the 2×6 twice. The first time we were both essentially practicing with the Ramset since neither of us had ever used one before. I have also never fired a gun before, so the kickback was a bit of a surprise. We discovered after installing the wood that some of the nails had bent and were not holding it securely, so we pried them out and did it a second time. The second time we did a much better job driving the nails straight into the wood and concrete. That wood is NOT going to budge anymore. At last it was time to fit the door into place. I should mention that earlier in the summer, we installed a new back door on the house and it was a painful, difficult process that nearly caused a divorce. I had sworn I would never install another exterior door, but here we were, doing the same thing. So I was a bit nervous about this process. We positioned the heavy patio door in place (moving heavy objects is NOT my strong suit), pushed it up, and…discovered that the opening was a hair too short. Despite all the measuring we did before purchasing the door. The door would have to wait until Renee could cut out the header and move it up a bit. We cleaned up the huge mess in the room so that the cats could be a bit more comfortable in the meantime. During the week, Renee worked out there on some smaller projects after work. She fixed up some of the wiring and installed nice new light fixtures (also from Home Resource). The door is finally installed! Finishing installing the door was actually somewhat anti-climatic after all my angst over it. 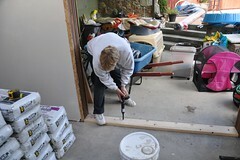 On Thursday (Renee’s day off), she cut out the header and moved it up to accommodate the new door. When I finished my real work for the day, I helped out. 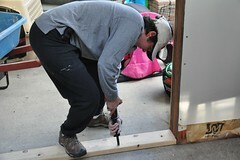 Once again, we hefted the door into place, set the bottom on our 2×6 and pushed the top up into place. This time it fit perfectly. We had a little trouble adjusting things with shims. We over did it the first time and the door became “off” enough that it would not slide smoothly. So, we pulled all the shims out and started over. The second time it worked, so once we were satisfied that everything was nice and level, we drove screws in all around the door. And it was finally in place. 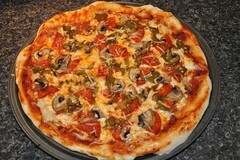 We celebrated with homemade pepperoni, mushroom, and green chile pizza. 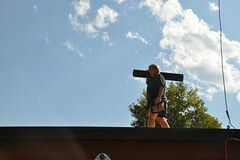 The third weekend was for the big job: installing the new roof. We had special ordered this Ondura roofing product from Lowe’s. Late in the week we got the call that it was in, so Renee picked it up and stacked in the shed area. It is a corrugated product, made out of asphalt. It looks and feels considerably more durable than the old plastic and fiberglass panels that had been up there before. We got mostly brown panels as well as a few of their translucent skylight panels so that both the greenhouse and the cats could have some natural light. We wanted to do it right this time. I really don’t want to have to install this roof ever again. It had better last. Our friend Toony came over to help, which was huge (Thanks, Toony!). 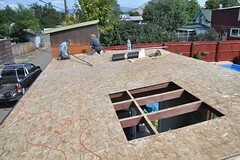 We started with replacing the rafter at the far end of the roof. The old one was rotted and nasty. 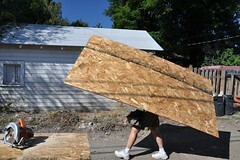 Then, we pulled down all the old panels and installed OSB (Oriented Strand Board) sheathing. Just this alone made a huge difference; we could finally walk around on the roof without having to balance on the rafters! Do we have the coolest neighbor or what? This is the same neighbor that would run his snowblower down the sidewalk for our entire block last winter. He would also take a short detour with it to clear our driveway. Really just an amazing guy. He and Renee occasionally get to chatting and exchanging war stories (literal war stories — Vietnam for him and Iraq and Afghanistan for her). He helped out all the rest of that day and all day Sunday too. We finished up Saturday by getting all the sheathing up and ready for the new roof. Sunday was a very, very long day. We cut openings in some of the OSB panels for skylights. It was a little creepy walking around on the roof once it had gaping holes in it. 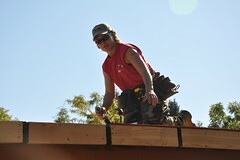 Ron worked on installing fascia board along the eaves. 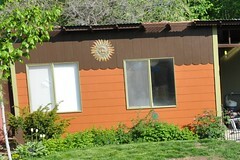 He also painted it for us and installed the new drip edge. Finally it was time to start installing the actual roofing panels. 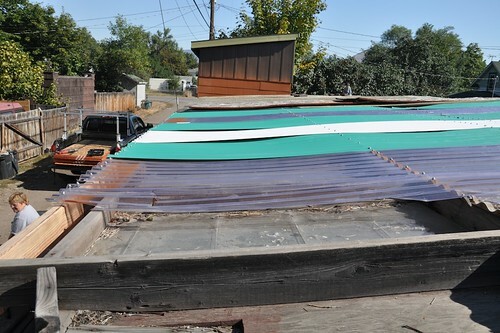 The panels were pretty easy to move around and position on the roof, but nailing them in place was very time consuming. 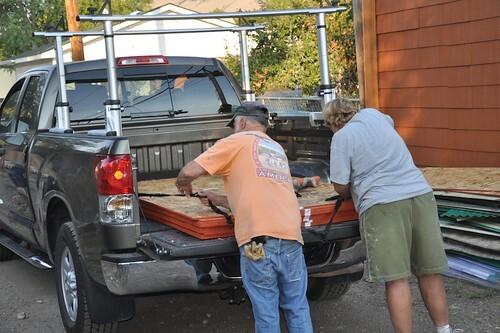 For the nine skylight panels, we had to pre-drill holes in the panels first, then drive in 4-inch roofing nails. For the regular panels, at least we didn’t need to pre-drill, so it went a little bit faster. It was getting dark by the time we finished. The next day I felt like I had been beat up, or taken part in a really hard workout. My whole body was sore! Finally the project was winding down, but not quite done yet. We weren’t able to find another good, correctly-sized window at Home Resource, so we just bought a brand new one from Lowes. We are getting to be pros and installing windows — way easier and quicker than doors. Once the window was in, Renee added brick moulding trim all around it and painted it with our green accent color. This completely dresses up the outside of the shed. 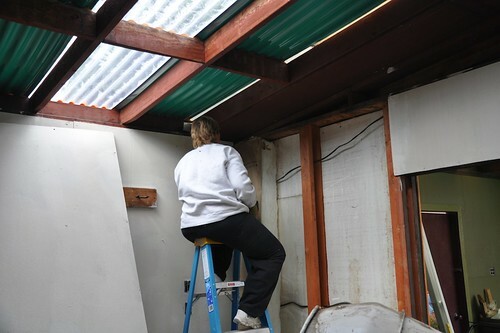 Now that we had a real roof on the shed, we could add insulation in the ceiling as well. This winter, the heat won’t all be escaping through the roof! Installing insulation in the ceiling was more difficult than installing it in the wall since the pieces had a tendency to flop around and land on our heads. I definitely recommend safety glasses during this task to keep that crap out of your eyes! Also, our rolls of insulation were not really wide enough for the areas we were filling in. Renee originally bought them with something else in mind, but we really wanted to use as much existing materials for this job as we could. So we made it work. 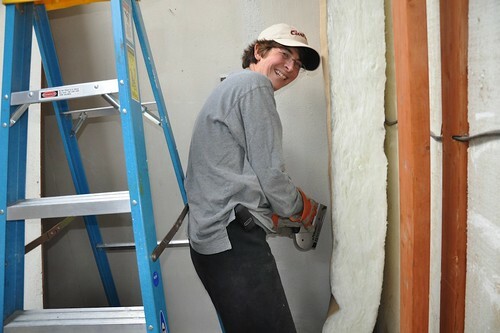 For the first couple sections, we installed the wider section of insulation, then cut a narrower piece, stapled it in place, and taped the two sections together. However, this was rather difficult and involved a lot of reaching over our heads and fighting with the insulation. Finally we came up with the idea to do the cutting and taping on the floor first, then fit the full piece into place. This worked out MUCH better and faster. Pretty soon the whole roof was nearly done. We ran out of insulation before we could do the last, smaller sections right around the skylights. We also still need to add sheetrock to cover up the panels. Eventually I would also like to install some nice double-paned glass over the skylight panels to help insulate a bit more. We also did more painting. The old wood walls just soaked up the paint and required several coats to fully cover. But the end result was great — no more dark, reddish stained walls, but a nice bright interior instead! Finally after all the insulation, painting, and cleanup, we rolled out a nice blue indoor/outdoor carpet we bought from Home Depot. 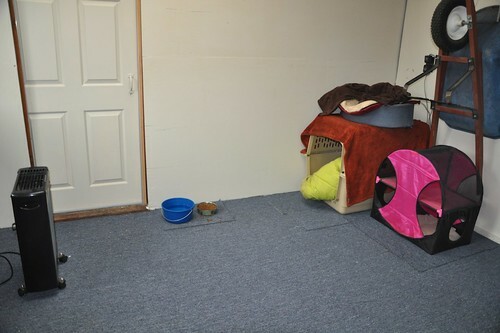 This is the finishing touch that really made it feel like a room, and no longer a “shed.” No more ugly concrete for the cats to walk on — now they have wall-to-wall carpeting! But What Do the Cats Think? The homeowner is getting cranky about how long this remodel is taking. "Can't you contractors speed it up? How much am I paying you?" Like most homeowners living in their home during a big remodel, the cats did not really enjoy the construction process at all. There was just too much noise, dust and clutter! After the first couple weekends, they did get somewhat used to it. Xena would just hunker down in her crate and ignore all the activity. 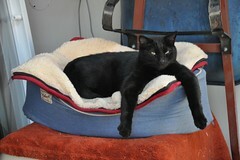 Pippin would go out to the patio and hang out with the dogs or sleep in his favorite chair in the shade. But once the remodel was complete, the cats decided it was worth all the trouble and inconvenience. Pippin likes to lay on a little mat in front of the new window. He can actually see out now, and it is no longer drafty. When we go out to visit the cats each morning, Xena now comes right out of her crate and asks for pets. She likes walking and rolling around on the nice clean, soft carpeting. We picked up a pet door designed for sliding glass doors for about five dollars at Home Resource (a great find as these run about $150 new!). We still need to replace the flap, but in the meantime, Renee designed a temporary flap to hold in some of the heat. Pippin has gotten practice going through the door. I don’t know if Xena will try going in and out, but hopefully she will give it a try if we have any nice warm days before winter sets in. It feels like we really finished this just in time. Late last week it started getting pretty chilly at night, so we setup the heater in their room. It is nice walking in there now and feeling no outside chill. The cats even have house plants! It is obvious every time we go out there that the cats are much happier now. They no longer live in a shed, or in a straw-filled barn. They live in their own private condo, and they love it! There were more pictures than I could fit into this post; if you want to see them all, visit my Great Cat Remodel photo set at Flickr. 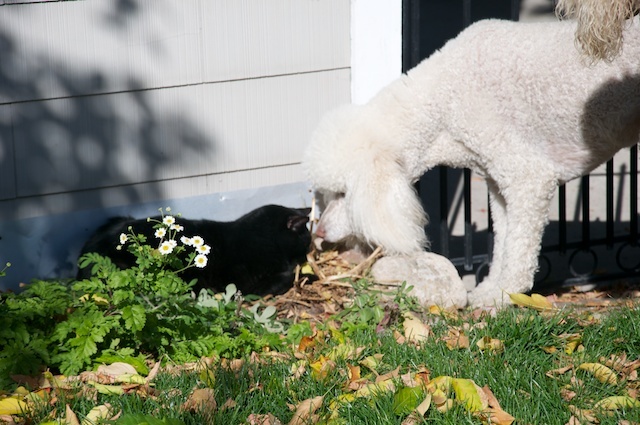 So I named the blog Muddy Poodles, and yet my first really long post here is not going to be about dogs, but rather, the cats. Xena and Pippin. How Did I End Up with Cats? I never used to be a cat person. Growing up, we always had dogs. I remember my dad commenting that he didn’t like cats because they “jump up on the stove and lick the butter.” I thought this was a little silly at the time since we didn’t keep the butter out on the stove where it could be licked, but I think he really just didn’t like the independence of cats and the fact that you really can’t train cats. 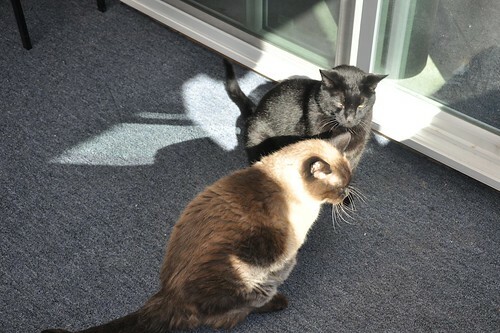 When I was with my ex-partner Laura, I somehow became the owner of two cats: Pippin and Xena. 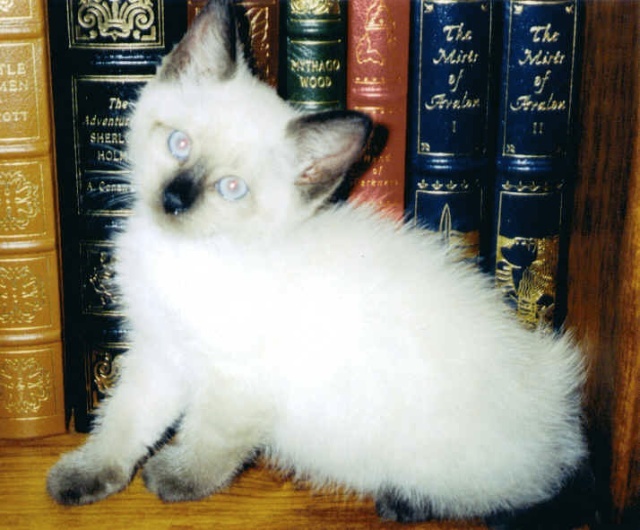 We got Xena back in 1997 when we lived in Oak Brook, Illinois. She is a full siamese. 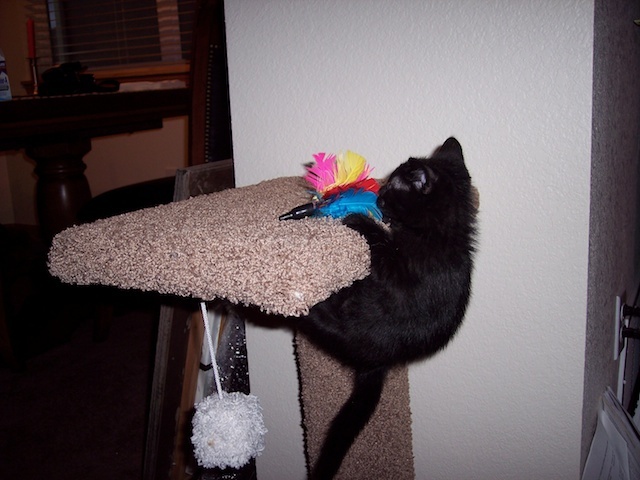 From the time she was a kitten, she often seemed more “dog-like” than cat-like. She wasn’t much into jumping up on things or climbing. Pippin came along after we were living in Montana. He is some sort of random domestic short-hair mix. He came from one of Laura’s co-workers when their cat unexpectedly had kittens, so we had no idea who his parents were. He was, unlike his sister, completely cat-like, which was a bit of a surprise to me since I was used to Xena and her non-cat ways. He climbed and jumped. He loved climbing on the little cat-tree we got him. He quickly learned how to jump up on the countertops. I’ve no doubt that he would have happily licked the butter if we had left it out on the stove. 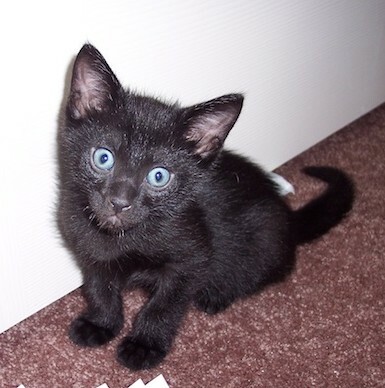 He was also the devil cat from day one. He chewed up my dining room chairs. Once, I came downstairs and found my cell phone with the charger cord dangling out of it like a little, frayed tail. The other end of the charger was still plugged into the wall. Glad he didn’t electrocute himself while chomping through the plugged-in charger. I think Pippin was never meant to be an indoor-only cat. He just got too bored being cooped up all the time. Fast forward a few years. Laura and I had broken up, I was now with Renee, and we decided to move in together after about a year. This presented a bit of a problem with the cats. Between the two of us we had (at the time we moved in) five dogs. Three of which were standard poodles. 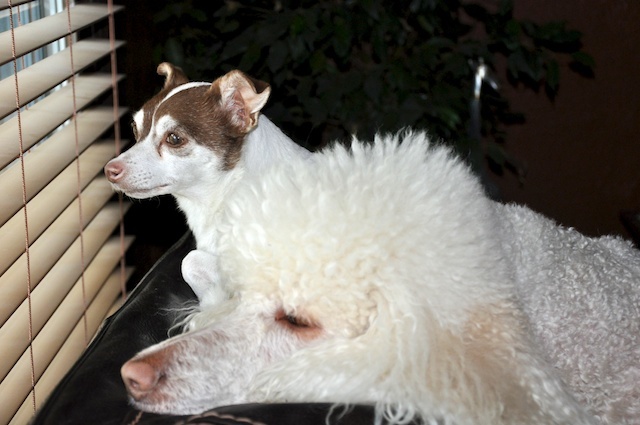 Sirus (the cream poodle) saw cats as prey and chased them whenever she had the chance at my house. So combining households was going to be challenging. Our solution was to set up the shed in the backyard to be a home for the cats. It wasn’t perfect or ideal, but it mostly worked. We cleared out the various gardening tools and things, moved in a big pet crate with a big fluffy comforter, and tried to make it as comfortable for them as we could. This solution worked, but had some definite drawbacks. It didn’t have a good solid door, so we tacked up some heavy plastic for the winter and got a small heater for them. This kept the chill out of the room, but significantly jacked up our electric bill. We also got some bales of straw to provide shelter from the cold, but the cats did not really like feeling as though they lived in a barn. Jungle cat on the prowl! On the other hand, there were several good things about this solution. Pippin loved having full access to the outdoors. 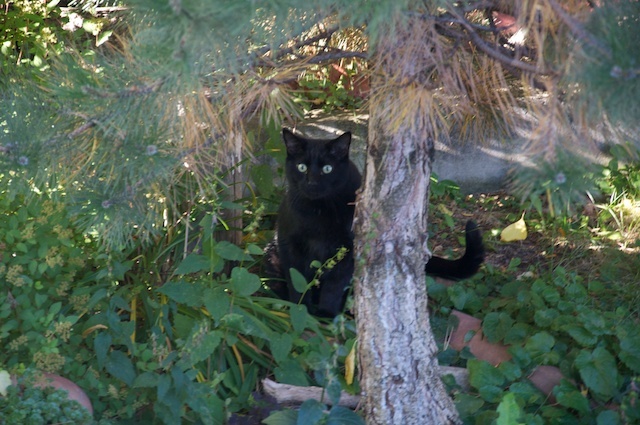 Once he got over his initial anxiety about being moved, he started exploring the backyard. 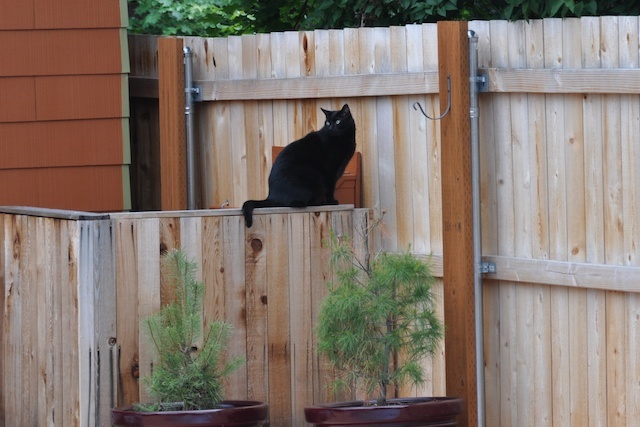 We have a tall fence and as far as I know, he has never managed to escape into the greater outdoors. But the backyard has become his personal kingdom. He loves to watch birds in the trees. I don’t think he’ll ever catch one (they have become smart), but he stalks them. It is pretty funny to see him, as he makes an odd little chittering sound when he watches them. He does the same thing with squirrels. He’s as interested in watch the squirrels as the dogs. In fact, I think that may have helped him and the dogs learn to get along since they actually have something in common with each other. Speaking of the dogs, the turn-around has been amazing. We keep an eye on Sirus because she sometimes still regards him as prey. But he is no longer afraid of the dogs. He stands his ground when he is out and just refuses to BE chased anymore. It is great to see him strutting around the yard, even when the dogs are out and about, with no signs of fear. The dogs have learned to respect him and mostly leave him alone. Xena has also adjusted to her new home. She doesn’t enjoy the outdoor access quite as much as her brother, but over the summer she did sometimes come out and lounge on the pool deck in the sun. To be continued in The Great Cat Room Remodel: Part II.